Down in the dumps about gloom and doom and all that in The Alice? Well, let this cheer you up. 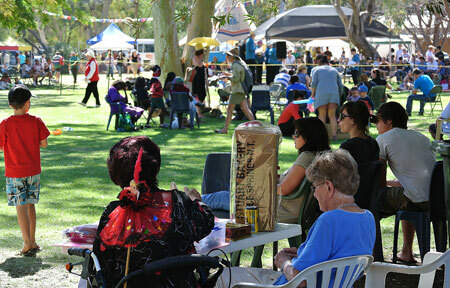 Figures aren’t finalised yet, but it looks like the annual Old Timers Fete on Saturday made $70,000. And all of that will stay in town, says Old Timers manager Mary Miles, head of the complex that cares for the town’s elderly and frail. It’s in line with the record takings over the past three or four years, although the warm weather this year reduced sales of hot food a little. Volunteers did it all – the three Rotary Clubs, Lions, Catholic Women, Baptist and Uniting churches fed, sold to and entertained the estimated 3000 strong crowd. The Girl Guides served 500 Devonshire teas. Some 20 businesses donated goods, services and vouchers to be sold at dozens of stalls. The chocolate wheel and fruit salad stall, previously run by a couple of service clubs that have shut down, were taken over by other community members. Mary’s husband Sam in years past had been “dobbed in” by her to run the white elephant stall – this year Jeanie Tahini took over. Mrs Miles says Hermann Marcic has finally made good of his announcement over many years to leave town, but Ross Muir took over the sound system. Paul “Fizzer” Fitzsimons again did the commentary all day. Prisoners were there for three days ahead of the fete setting up marquees, chairs, tressels and so on, and then again the day after, tidying up. Chambers Engineering Services Pty Ltd provided, free of charge, the traffic management which government bureaucracy has turned into a bit of a mission these days. And hundreds of people said hello to each other, after not seeing each-other all year, except at the show, maybe. And so on. Not so bad after all, is she, the old Alice? What an enjoyable day! Congratulations to all the hard-working people who make this a day to remember. Yes, met up with lots of old friends, and spent a lot of money (probably on things I’ll donate for next year’s fete!). The Old Timer’s has been a yearly event for me for over 30 years, and I hope it continues when I end up living there. Well done Alice for supporting your own.